First autumnal look!!! | Cosa Mi Metto??? Finally is getting a little bit colder even here! Enjoy my first autumnal shooting: for this occasion I choose same colors that fit perfectly with this new climate! Alla fine sta facendo un pochino più freddo anche qui! Godetevi il mio primo shooting autunnale: per questa occasione ho scelto dei colori che si adattan perfettamente con questo nuovo clima! A special thanks to my Luca, always patient in taking photos! Romance is present in your images, even in autumn! Keep it up! Brava! Love your bag and sunnies. Also your make up perfect fit to top - nice. Look autunnale con i sandali?? Beata teeee! Mi piace molto l'outfit, in particolare gli orecchini! Great colour combo! My husband takes all my shots too!! We rely on them so much!!!! You look amazing! I love your jacket!! 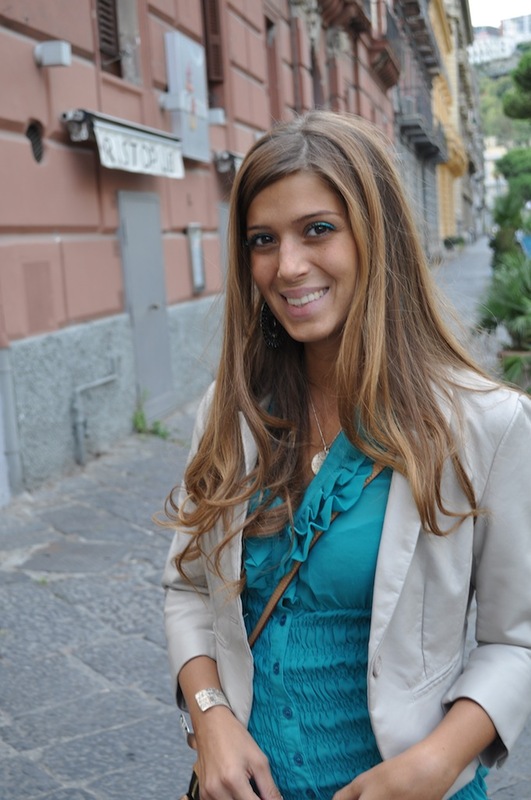 nuovo outfit sul mio blog: ti aspetto! La camicia è proprio bella!!! You say first, I say 20th :). I love the sling,the cropped blazer and the shoes!Awesome!So autumn! Love your platforms... but how can you wear them on a chilly day? hey gal, I always visit you to follow but your follower box is not showing anywhere?i always check but WHY?? dont worry i will visit you all the time :)have fun! Molto carina! Il colore del top ti dona molto! belle le zeppe! So cute!!.. I love your bag!! I'm glad that I got to know your blog, for I enjoy so much your delightful images and smart & chic outfits. Because I love your country and have friends living there, hope I have the chance to meet you some time when visiting. Excelente look, very nice colours. I love your shirt. Love your shoes and the top! Molto carino questo outfit, Fabrizia! Love the blazer and the shirt, and the combination of colours!! Mi piace mi piace!! :) La maglia turchese è proprio bella e ti dona moltissimo. I love the look. The blue looks really amazing. Love that color!!! //Haha, sorry for such a late response, have had some things that needed to be sorted out :) I will follow you as well :) Why don't you do like a style report on Luca? That would be awesome for male readers! Aqui também tem feito frios esses dias...adorei a cor da sua blusa e a sombra combinando com ela tá muito bacana! beijos, paz e bom final de semana! Gorgeous as always!!! Love your top! You look beautiful! That blouse is so pritty! Kisses! Adorable top and love the earrings! Cool, casual outfit! Love the wedges and the ruffled blouse, and the shades! Great blazer, I like this casual outfit. I love the grey with the turquoise. Really cute. Your shoes are fun and the color is vibrant and really suits you. Love the matching eye shadow, it's a great touch - but the LV purse of course is to die for! So many thanks for all your lovely words!!!! Tantissimi ringraziamenti per le vostre adorabili parole!!!! You look wonderful.. I love the top & blazer! Thanks for taking the time to visit my blog!